Editor's note: We reviewed the the Peq connected-home system in January 26, 2015. Comporium Communications acquired the Peq platform and transitioned Peq subscribers to its own ReadyHome platform effective May 24, 2017. This review does not apply to ReadyHome. Peq (pronounced “peek”) is a robust connected-home system from Smart Home Ventures that includes of a variety of sensors, lighting controls, security cameras, and other components that connect to a wireless central hub manufactured by Netgear. You monitor and control the system using a web browser or a free app on your smartphone or tablet of choice. You can acquire a Peq system by purchasing $120 starter kit that includes the hub and one door/window sensor, or one of the pricier kit that include more components (the $490 House & Home kit includes the hub, a thermostat, and five sensors: two door/window, two motion, and one water. You can expand the system with additional sensors and components at any time. The Peq system will also work with a of range third-party devices, including smart deadbolts from Yale and Kwikset, the Nest Learning Thermostat, and Philips’ Hue LED light bulbs. 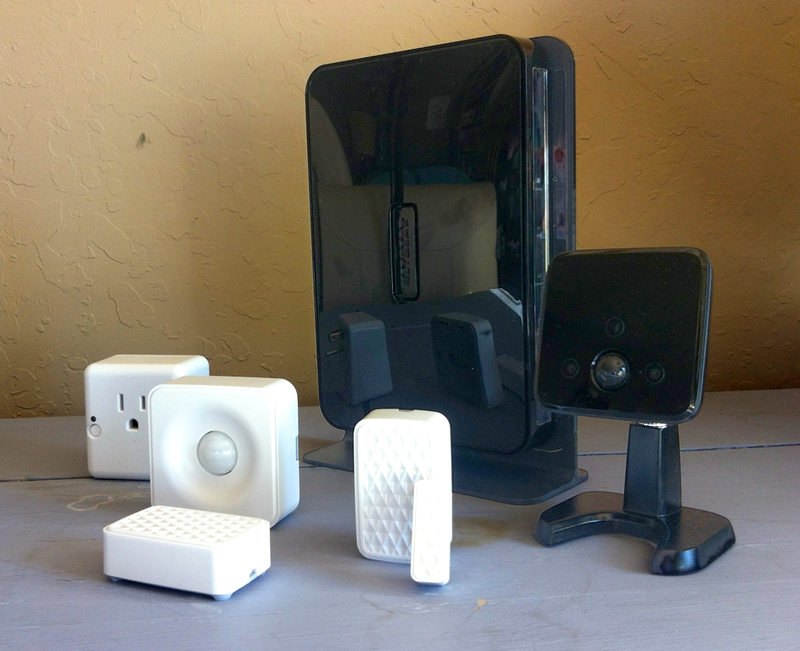 For this review, Smart Home Ventures sent the starter kit (the hub and one door/windows sensor that’s priced $120) plus one night-vision security camera ($130), one smart plug ($55), one motion sensor ($45), one water sensor ($50), and a thermostat ($130). The total cost of this system would be $530, but Smart Home offers various discounts when you buy multiple components at the same time. 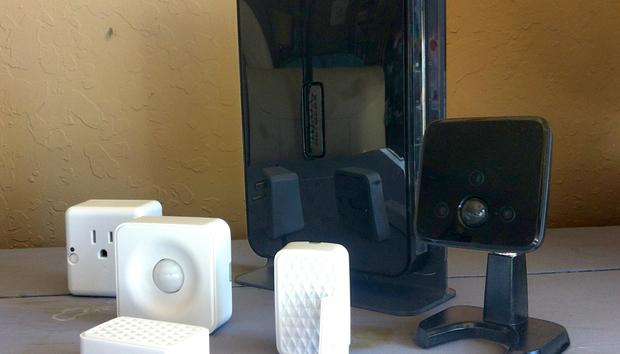 A Peq system consisting of the hub, a night-vision security camera; one smart plug; door/window, water, and motion sensors; a thermostat (not shown in this picture) costs $530. In addition to the purchase price of the hardware, you’ll also need to sign up for a $10 per month service plan. In addition to ongoing product support (7AM to 10PM Eastern time) and firmware updates, the service plan includes cloud storage for up to 50 videos and 50 photos per day for up to 30 days. Unlike the Lowes’ Iris system, this subscription fee is not optional (although it could be argued that the Iris subscription fee isn't optional either, if you really want that system to be effective). 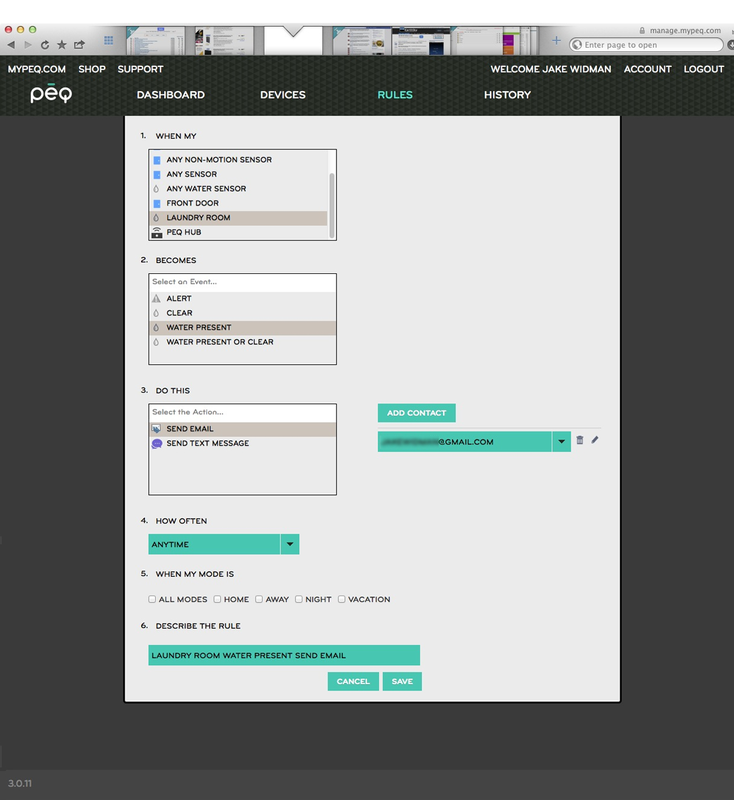 As with the Iris system, the Peq’s service plan does not include professional monitoring. So if a motion or door/window sensor is triggered when you think the house should be empty, you’re on your own when it comes to summoning an emergency response. Service plans that do offer professional monitoring, of course, tend to cost much more and typically tie you into a long-term contract with onerous early-termination fees. On the other hand, they also come with professional installation. AT&T's Digital Life offerings, for instance, start with a Smart Security package that costs $150 for the equipment plus a monthly service fee of $40. Adding connected-home features will rapidly increase that subscription fee. Packages from service providers such as ADT, Comcast, and Vivint are similarly pricey, but you don’t need to worry about setting up the system yourself. Once a device is set up, you can use rules to configure its behavior. This rule tells the system to send an email alert if the water sensor detects water. The Peq system is largely powered by Icontrol Networks, an old hand in the connected-home market that a number of other service providers have selected: ADT (Pulse), Comcast (Xfinity Home), and Cox (Cox Home Security), to name a few. To set it up, you connect a Netgear ASG1100 hub to your router. You then you log onto the Peq website and wait for the hub to be recognized. The instructions warn that this can take up to 15 minutes, but it took about half that long in my case. As with every step in configuring the system, you can view a short video of the process before you start. Once the hub is "discovered" by your network, it downloads any pending firmware updates. Then you're ready to start pairing devices via the browser interface. The general procedure is to power-on the new device, either by plugging it in (as with the lamp module), or pulling out a plastic strip that blocks the battery (as with the door/window sensor). Now place the device near the hub until it's discovered and paired, at which point you give it a name and place it where you want. Each device comes with step-by-step onscreen instructions that are very easy to follow. Really, there's nothing to it. I started with the door/window sensor. It has two components, the sensor and a magnet. Once the sensor is paired, you put one component on your door or window (using either a mounting bracket or double-sided sticky tape, both of which are included) and the other part on the jamb or frame. You must line up the two parts and make sure they're within a half-inch of each other. Once that's done, your onscreen or in-app Dashboard displays the status of the door (open or closed) as well as a notification if it changes. The Peq system's Dashboard gives a quick overview of all the paired devices' status as well as a rundown of all your recent notifications. Next, I set up the water sensor. After it's paired, the instructions say to test it by holding it to a damp paper towel. This is where I ran into one of the few minor glitches I found with the system: the damp paper towel did register as "water detected," but the message remained even after I removed the towel and dried the sensor. Removing and replacing the battery worked to reset the device. 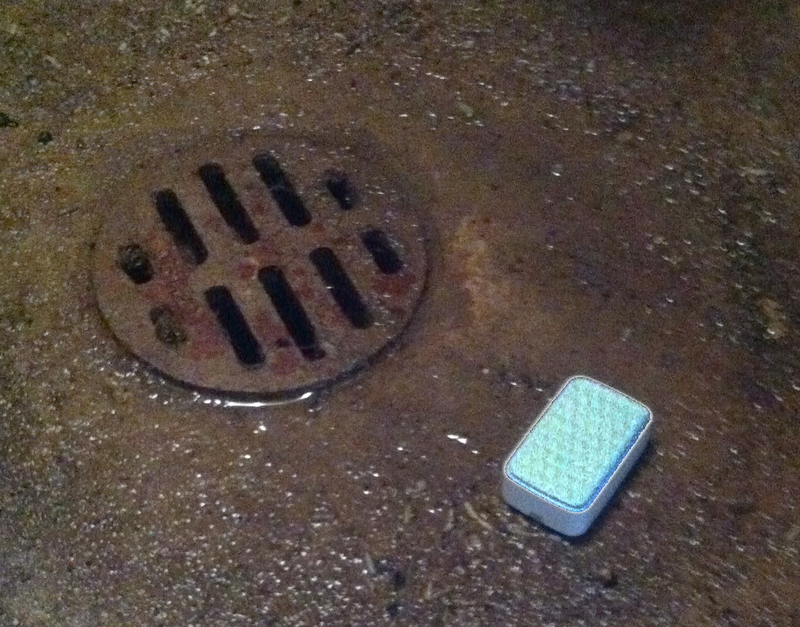 Once the sensor was ready, I placed it on the floor of my basement, next to the drain where there's always water when the washing machine is going. I started a load of laundry and went back upstairs. Sure enough, in about 10 minutes my Dashboard showed a "water detected" message. The water sensor can tip you off to a water leak, but the system doesn't currently provide any means to turn the main water valve off. I tested three other devices in my assortment: the lamp module, essentially a smart plug; the motion sensor, and the camera. As with the door and water sensors, the instructions and videos were clear and setup was painless. I did not test the thermostat, because I didn't think my landlord would appreciate my taking his existing one out. Once your various devices are paired, you can start setting up rules to govern how they behave: automating when a lamp turns on and off, for example, or having a sensor send an email or text alert or trigger an action by another device. For example, I set up a rule for the water sensor to send me an email when it detected water. So in addition to the notifications in my Dashboard about the water in the laundry room, I also received email alerts. In fact, I received an email notification every 15 minutes until I corrected the "problem" in the basement by moving the sensor. I also made a rule for the lamp module to turn on every evening at 4 PM and leave the lights on for eight hours, as well as to turn on when the door was opened or when the motion sensor detected movement in the room. It turned out that the way these rules interacted was really the only area where I ran into problems getting the system to work the way I wanted. 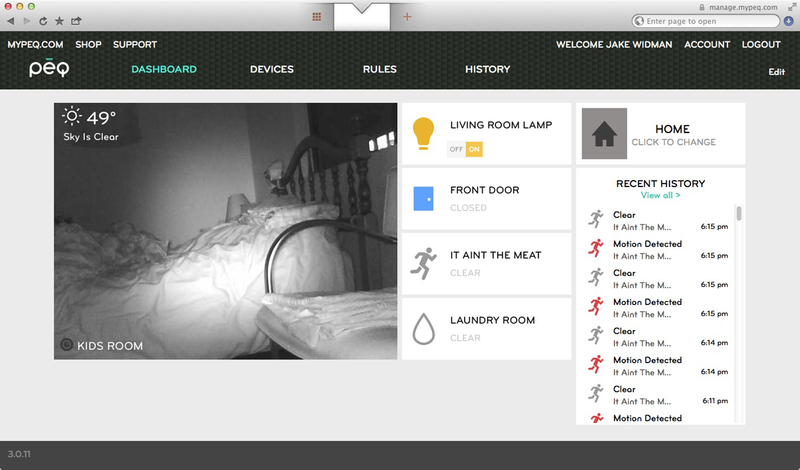 The motion-sensor rule said to turn on the lamp and turn it off again after five minutes. That worked, but it overrode the rule about turning the light on in the evening, so that the lamp turned itself off after five minutes even though it was within the 4 PM-to-midnight time frame. I fixed that by tweaking the motion-sensing rule to not apply during the hours the lamp would be on anyway. 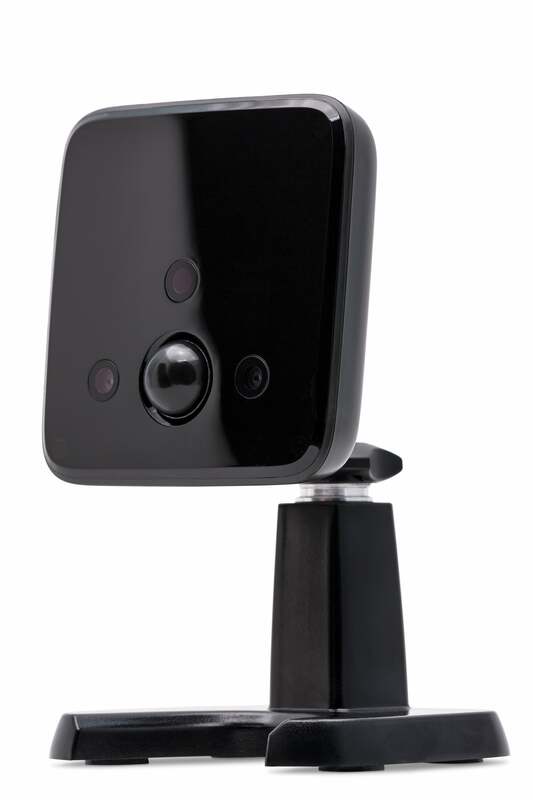 The $130 security camera includes night vision. The only other failure was on my part, when I turned out the lamp at bedtime the usual way, using its switch. That meant the Peq system couldn't turn the lamp on for any reason, and it took me a few minutes the next day to figure out why none of my rules for the lamp were working. In a conversation, Steve Bosch, Peq vice president of product and strategy, agreed that part of the learning curve with the system is training yourself to turn things on and off with the system, rather than with physical switches. My only other real criticism of the system had to do with the limited functionality of the mobile apps. They let you control your devices and turn rules on and off, but you can't create or modify a rule with them. That ability, fortunately, will be part of the new interface and feature set that Smart Home is planning to roll out in the second quarter of this year. In the new interface, each device shown on the Dashboard has a "live tile" that not only displays its current status but offers some direct control: Dimming a light by dragging downward on the tile, for example. You'll be able to have multiple dashboards, each with its own set of tiles, to accommodate different people and situations. And the system will also offer connections with new devices, including garage door openers, fitness trackers, and the Zubie "connected car" system. The new interface looks like an improvement, but really I didn't have any problems with the current one. All in all, if you want an easy-to-use connected-home and home-monitoring system, Peq fits the bill. It's easy to set up, and everything just works as it's supposed to, right out of the box.